In today’s world of extensive quantities of electronic documents, managing PDF files have become a long time issue. We cannot avoid the importance of the PDF file format within government or corporate organizations. Having a number of pages within PDF files and getting the Bates numbered manually may be a concern to each and every individual. Law firms and the courts have specific numbering requirements while sharing discovery related documents. Most of the businesses organizations need a solution as a way to detect and analyze payments or dues which they have to bear. Not all this is possible without a proper Bates Numberer. In such a scenario, PDF Bates Numberer software plays an effective role. PDF Bates Numbering Tool: How can it Help? PDF Bates Numberer is an application for indexing of important PDF documents so that they are retrieved or located conveniently. Users won’t have to search the entire database to search the documents; there is a specific watermark or index which will help you to retrieve the PDF files easily. Bates Numbering is a process used mainly in business, medical, and legal firms to uniquely recognize each page in a bunch of PDF documents by allocating a sequence of auto-incrementing digits. Bates numbering in case of deposition documents assists both witness and examiner to go ahead on the same page, and creates an accurate record. Bates numbering on judicial judgment evidence initiates the identification of the record in an easy manner. 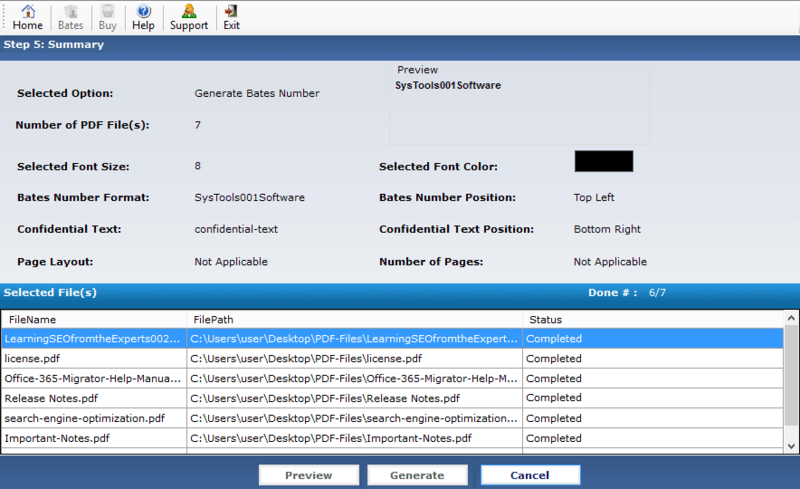 PDF Bates Numberer is a stand-alone application in providing the option to uniquely generate the Bates Number on each of the page. Let us analyze the technical features of the tool to get a clear and better understanding of this utility. After clicking on Bates option, the user will be directed to the following screen. “Generate Bates Number”: This option inserts Bates Number on selected PDF pages. “Generate Bates Number for File series”: This option inserts Bates number to a series of PDF files contained in a folder. “Print PDF”: With this option, one can take out the print of Bates Numbered pages. Suppose we choose to select the first option i.e. “Generate Bates Number” On clicking “next” we will be directed to another screen. On the Left hand side of the screen, there are six options. “Add file(s)”: You can add the PDF files individually by browsing them from your local folder. “Add folder”: With this option, you can add the folder which contains PDF files. You can also change the priority of PDF files by the option Move up or Move down. Suppose you want to replace the files with other PDF files then you can use the option “Remove all” for removing all the files or “Remove” to remove a single file. The screen shows the selection of PDF files from the local folder which is to be bates numbered. Now, the screen displays all the selected files. Right bottom of the screen, there is an option to remove encryption from PDF files if your files are encrypted. On clicking “Next,” you will be directed to fill the credentials. The text boxes can be filled out as per your need. “Additional Text Positioning”: Enables the user to set the position of additional text on the following positions: Top left, Top right, Bottom left, and on the Bottom right of the file. The Bates Numbering utility allows you to name the files as per your convenience. There are two file name conventions that can be used to save the resultant PDF file. In addition, there is an option to save the file with the positioning of first bates number which was selected while including the bates Number. There is also an option to save the generated PDF file in the desired location by selecting the destination path. Display screen will come up which will give a summary of all the selected information. The software generates the preview of all the selected options added to the PDF file. 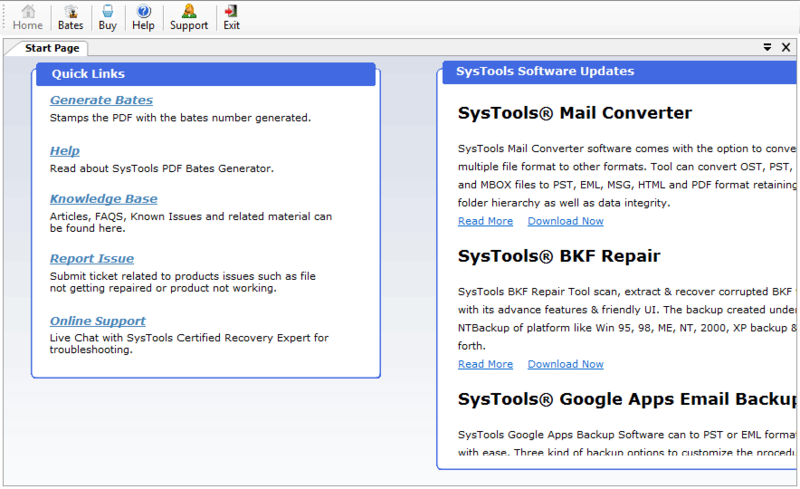 After the generation of bates number, the software provides a complete status report. With the demo version of the tool, you can check each and every step of Bates numbering on PDF file. The demo version sets up a watermark on the PDF file with “DEMO”. This Bates Numbering Tool includes number of options that can help in managing multiple PDF files. The potential and speed of the tool is worth praise. In addition to the numbering attributes in the tool, the added option for printing the PDF files is an advantage. Definitely, this tool is a Yes for adding Bates number to PDF file and investment in it can save you from paying lump-sum for Adobe Acrobat.